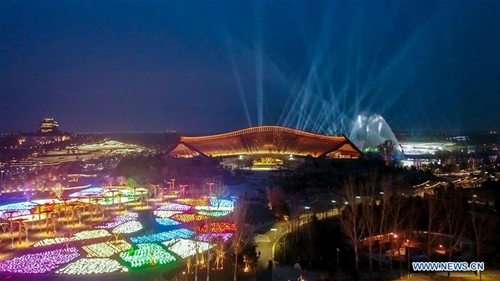 Cardinal Gianfranco Ravasi, president of the Pontifical Council for Culture, would attend "relevant activities" of the International Horticultural Exhibition 2019 Beijing China (Expo 2019 Beijing), Chinese Foreign Ministry Spokesperson Lu Kang said at a daily briefing on Wednesday. Lu said China and the Vatican have continued to talk following the agreement on bishops and are working hard to improve relations. This will be "the first time that the Holy See officially participates at an Expo," Asian News reported. As of Wednesday, more than 110 countries, regions and international organizations have confirmed their participation to the event, marking the highest attendance in the expo's history, organizers told the Global Times. "The Holy See's attendance at the Expo shows that it's feasible and acceptable for both sides to conduct constructive exchanges while a diplomatic relation is not established yet," Wang Meixiu, a research fellow at the Chinese Academy of Social Sciences, told the Global Times on Wednesday. Such explorations on exchanges in the religious and cultural sectors are worth trying, said Wang. The Vatican will open a pavilion of around 200 square meters, and documents from the Vatican Apostolic Library regarding herbaria and the medicinal properties of herbs and plants will be displayed, according to a statement released by the Vatican on Tuesday. Catholic churches have the tradition of appreciating and conserving animals and plants, and the Expo is a pertinent cultural event concerning the urgency of protecting the environment and ecology, said Wang. The event could also enhance friendship between participants, said Wang. Participation in the expo and other cultural exchanges have the important task of creating "an atmosphere" that facilitates dialogue, Ravasi said. In October 2017, Vatican appointed Ravasi as general commissioner to attend the expo. The Expo, starting from April 29 until October 7, is expected to host more than 2,500 activities, including seminars, floral art competitions, and float parades. The 162-day event is expected to witness 16 million visitors from home and abroad, stated a press release sent to the Global Times by the National Forestry and Grassland Administration on Wednesday. Iconic cultural elements in China will be presented in outdoor exhibit areas, such as the giant panda-themed garden set up by Southwest China's Sichuan Province. The press office of Holy See did not respond to an interview request from the Global Times as of press time.